Flexible EPDM pond liners provide easy installation that will conform to any size and shape allowing them to be used in even the most creative water feature. 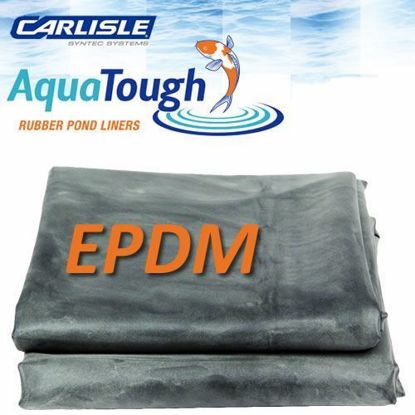 Carlisle's 45 mil Fish-Friendly EPDM AquaTough Rubber Pond Liners combine design flexibility, long-term durability and easy installation, making them an ideal choice for a variety of waterscape applications. Carlisle’s AquaTough membranes are the only brand that will give you the added benefi t of consistent J-Tear protection. Pond Liner Underlay increases pond liner life and makes liners more puncture resistant by protecting them from sharp objects in the soil.